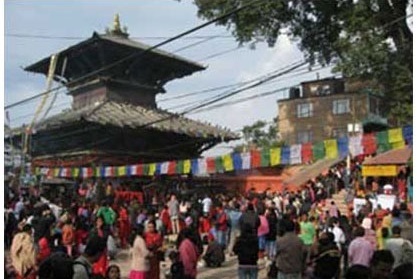 Manakamana, a very popular pilgrimage in Nepal, is a temple of one of the manifestations of the Hindu goddess Bhagwati. Bhagwati is believed to have the power to fulfill wishes. It lies 125km to the west of Kathmandu. It is a steep three hour hike from Abu Khaireniion Kathmandu-Gorkha Highway. Cable-cars also take travellers to Manakamana. Cable Car ticket cost Rs 320 for Adults and Rs 225 for children. We are travels operating firm in Gorakhpur, Uttar Pradesh established since 1980 by the two brothers Mr. Anil and Sunil Kesherwani. We have started our business with 1 Bus with our good and timeliness service we have created a good reputation in mind of people and became a biggest Bus fleet owner in the city. We are best and oldest travel agent in Gorakhpur,Travel agent in Gorakhpur for Manakamana Temple,Tour operator in Gorakhpur for Manakamana Temple,Bus hire for Manakamana Temple in Gorakhpur,Tour Package for Manakamana Temple in Gorakhpur,Travel agent for Manakamana Temple in Gorakhpur,Buses In Manakamana Temple,Bus Booking Service in Manakamana Temple. Copyright © 2016 Kesherwani Travels, Inc.